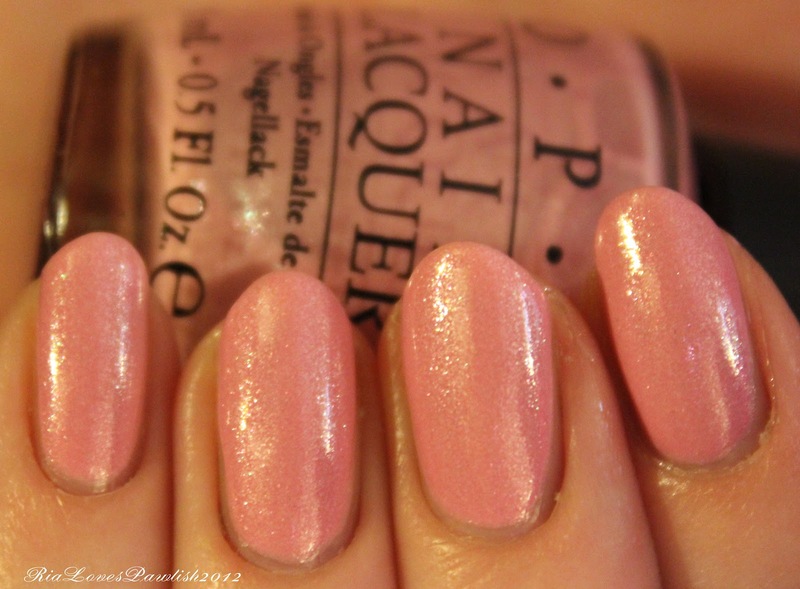 Ria Loves Pawlish: OPI Pedal Faster Suzi! continuing on with the 2012 OPI Holland collection, we're looking at Pedal Faster Suzi! today. i reallyREALLYreally love this color!! it's a divine shimmering light pink... definitely evokes thoughts of petals... such a cute play on words... and yes, i'm a geek :) the only disappointment with this polish is the opacity, i was hoping for two coats... but after three there was still a slight visible nail line and that was with starting the manicure with Seche Base. bums. of course, this was only visible on close inspection, so it won't be a deal breaker for most. it's a slightly blue toned pink, but it is really close to being a neutral tone. this color would be a perfect accent for any outfit... light pink is so ladylike and the slight silver shimmers make it more fun! one coat Seche Base, three coats PFS!, one coat Seche Vite.